Professor Helmuth H. Schloessin died on November 4, 2013 at age 89. Helmuth's earliest research was on the mechanisms of glacier flow which earned him a PhD from the University of Cologne, Germany in 1955. He then joined Frank Nabarro's group in the Department of Physics at the University of the Witwatersrand in Johannesburg, South Africa as a Research Fellow in 1956. 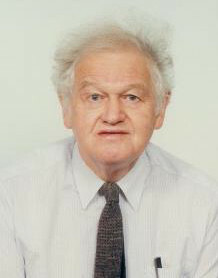 Much of his early career was spent in the Solid State Physics Research Unit at Wits where he carried out experimental studies of the mechanical properties of quartz and tungsten carbides as part of the Drilling Research Project. In 1969 he moved to the University of Western Ontario in London, Canada where he remained in a faculty position until his retirement in 1989. He developed a high pressure-temperature physical properties laboratory in the early 1970's and installed 200 ton and 1000 ton cubic anvil presses of H.T. Hall design (both of which are still in use today). His interests in high pressure studies spanned upper mantle heat flow (thermal conductivity measurements of dunite, enstatite, SiO2, MgO, NaCl); kinetics of, and physical property changes at, polymorphic phase transformations (CaCO3, NaCl, Fe, perovskite structures); ferroelectric states occurring as elastic and dielectric inhomogeneities; electrical properties of core materials; as well as new techniques to generate high pressures in small volume elements and to measure physical properties at high pressure and temperature. Helmuth's research pursuits were as broad as his approaches were diverse. During a 1976-77 sabbatical at the University of Cambridge with Jack Jacobs, he developed a model of core energetics. His long term interest in potential fields led him to studies of the deformation of the lithosphere by solid Earth tides and later he used MAGSAT vector field data to isolate the lithospheric field. His other experimental interests included electrification and luminescence of minerals which were applied to the possible origin of earthquake lights. In the 1980's, he built a high temperature bending apparatus to investigate the creep of single crystals for the study of upper mantle rheology in collaboration with Giorgio Ranalli. Helmuth's untiring curiosity in condensed matter physics and solid earth geophysics kept him active in research well past his retirement.